Gayle notched his second double in as many games, extending the Magpies' unbeaten run to six games in all competitions as they racked up a fourth consecutive win in the process.And, with Norwich City having drawn at Fulham, the victory at Oakwell sent United to the top of the Sky Bet Championship table for the first time this season. And, with Norwich City having drawn at Fulham, the victory at Oakwell sent United to the top of the Sky Bet Championship table for the first time this season. Rafa Benitez's side had the better of a low-key first period, but were unable to make their dominance count in what was a scrappy opening 45 minutes.But the contest livened up after the break, with Gayle's first coming just under three minutes into the second half and both his and his team's second making the points as good as safe with just over 20 minutes left on the clock. 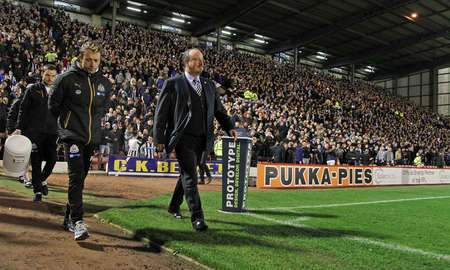 But the contest livened up after the break, with Gayle's first coming just under three minutes into the second half and both his and his team's second making the points as good as safe with just over 20 minutes left on the clock.Benitez opted to shuffle his pack for the midweek trip to Yorkshire, making three changes to the team that beat Brentford 3-1 at the weekend. Matt Ritchie returned following illness to replace Christian Atsu, with Mo Diame coming in for Ayoze Perez and Isaac Hayden earning a start, at the expense of Jack Colback, alongside Jonjo Shelvey in midfield. An uneventful start to the contest brought about few clear-cut chances. When a Ritchie burst down the right was abruptly and unfairly halted by Adam Hammill, Shelvey whipped a dangerous free kick into the Barnsley box but goalkeeper Adam Davies got there just before Gayle to punch it clear. At the other end, skipper Conor Hourihane fired wide from the edge of the box as the hosts looked to capitalise on a rare sight of goal.Just as they had at St. James' Park on Saturday, Shelvey's deliveries caused plenty of problems, but it was one of United's other creative threats, Ritchie, who laid on the first real scoring opportunity of the half. The Scotland international tore down the right and sent in a cross towards Gayle, scorer of a brace against the Bees at the weekend. With the ball dropping just behind him, Gayle tried a scorpion kick of sorts, though his improvised effort cleared the bar. Just as they had at St. James' Park on Saturday, Shelvey's deliveries caused plenty of problems, but it was one of United's other creative threats, Ritchie, who laid on the first real scoring opportunity of the half. The Scotland international tore down the right and sent in a cross towards Gayle, scorer of a brace against the Bees at the weekend. With the ball dropping just behind him, Gayle tried a scorpion kick of sorts, though his improvised effort cleared the bar.A well-worked free kick involving taker Shelvey and Ciaran Clark led to a low Ritchie drive, which was blocked on its way towards goal, while the Tykes' creator-in-chief Hammill posed the Magpies' rearguard the occasion problem. When a free kick won by the ex-Wolves winger came back off the wall, James Bree took aim from distance, with his shot whistling just past Karl Darlow's post. 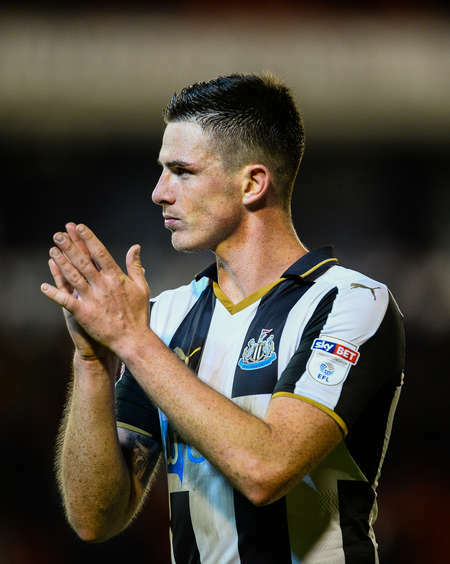 A well-worked free kick involving taker Shelvey and Ciaran Clark led to a low Ritchie drive, which was blocked on its way towards goal, while the Tykes' creator-in-chief Hammill posed the Magpies' rearguard the occasion problem. When a free kick won by the ex-Wolves winger came back off the wall, James Bree took aim from distance, with his shot whistling just past Karl Darlow's post.Gayle, the division's leading goalscorer, then tested Davies with a well-struck free kick as the half drew to a close with the deadlock still intact. Gayle, the division's leading goalscorer, then tested Davies with a well-struck free kick as the half drew to a close with the deadlock still intact.A couple of minutes after the restart, though, United went ahead. 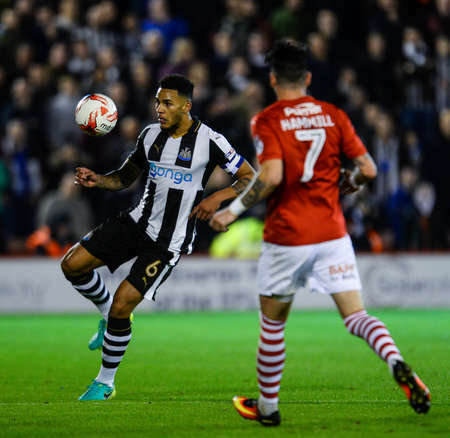 It perhaps wasn't the prettiest of finishes, but when Barnsley failed to clear a Ritchie corner, Gayle was perfectly placed to get to the loose ball before keeper Davies and fire Benitez's ahead in front of the end housing the near-6,000-strong Newcastle support. A couple of minutes after the restart, though, United went ahead. It perhaps wasn't the prettiest of finishes, but when Barnsley failed to clear a Ritchie corner, Gayle was perfectly placed to get to the loose ball before keeper Davies and fire Benitez's ahead in front of the end housing the near-6,000-strong Newcastle support.Sam Morsy responded for the hosts with a shot that fizzed over Darlow's crossbar, but in truth, this was a lead that the Magpies never really looked likely to relinquish. Ritchie almost found the onrushing Hayden in the box with a delicately-weighted ball in from the right, while Diame's strike on the turn flew just wide of Davies' upright as the visitors' retained their attacking impetus. Sam Morsy responded for the hosts with a shot that fizzed over Darlow's crossbar, but in truth, this was a lead that the Magpies never really looked likely to relinquish. Ritchie almost found the onrushing Hayden in the box with a delicately-weighted ball in from the right, while Diame's strike on the turn flew just wide of Davies' upright as the visitors' retained their attacking impetus.Some superb interplay between Yoan Gouffran and Diame on the right gave advancing full back Paul Dummett a sight of goal, but his volley went over. Some superb interplay between Yoan Gouffran and Diame on the right gave advancing full back Paul Dummett a sight of goal, but his volley went over.And with just over 20 minutes remaining, Gayle made it two. The former Crystal Palace man latched onto Ritchie's ball over the top, beating Davies to it once more to lift the ball into an empty goal and send the United faithful wild. And with just over 20 minutes remaining, Gayle made it two. The former Crystal Palace man latched onto Ritchie's ball over the top, beating Davies to it once more to lift the ball into an empty goal and send the United faithful wild.Diame headed another Ritchie centre wide of the target soon after and Gayle almost had his second hat-trick in black and white in the closing stages when he stooped to head Shelvey's curling free kick towards goal, but Davies got enough on it to parry it away as Newcastle retained the upper hand until the final whistle. Diame headed another Ritchie centre wide of the target soon after and Gayle almost had his second hat-trick in black and white in the closing stages when he stooped to head Shelvey's curling free kick towards goal, but Davies got enough on it to parry it away as Newcastle retained the upper hand until the final whistle.